The Little Prince is a classic children’s book that has been on my list for some time, so imagine my surprise when it appeared as well in a book I recently enjoyed, Hell and Good Company: The Spanish Civil War and the World it Made by Richard Rhodes. I had no idea that Saint-Exupéry played a role in the Spanish Civil War – apparently he volunteered there as a pilot. This helped The Little Prince jump to the top of my list, and here we are. As it is a children’s book, it was an easy, quick read, just under 90 pages and full of delightful illustrations by Saint-Exupéry himself. These illustrations are an important part of the story: the power of art, and its greater or lesser power to realistically capture appearances. Apparently my edition is a new translation, by Richard Howard, and comes with newly restored illustrations as well. Howard opens with a brief meditation on the important work of translation that I found thought-provoking. And then the story itself, which concerns our narrator, a pilot crashed and stranded in the African desert, and the little prince he is surprised to meet there. The prince tells us he has come from his own tiny little planet, far away. He is worried about a very special flower he left there. Thus proceeds the story of the little prince, and our pilot’s somewhat clumsy attempt to help; the prince’s departure, and the pilot’s dealing with it. …That’s the way they are. You must not hold it against them. Children should be very understanding of grown-ups. A beautiful story, sweetly told and charmingly illustrated, with layers to appreciate on different readings and at different ages: everything a kid’s book should be. Rating: 7 boas with elephants inside them. 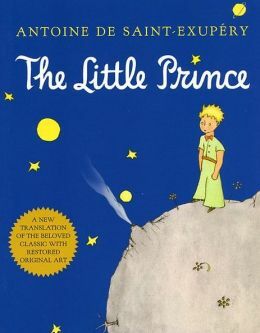 The Little Prince is by far one of favorites books of all times. I read it for the first time when I was quite young and I’ve read it at least 3 o 4 since then. It’s one of those books that hide different meanings and you keep finding new ones each time you read it. I’m really glad you liked it. Me, too! Glad I finally found it. Thanks for visiting, Leonela. the tempting allusions of the “allegory” you describe…. It’s great that all this is in a children’s book. Isn’t it? As Leonela points out – a lot to keep discovering in this children’s book, for adults.